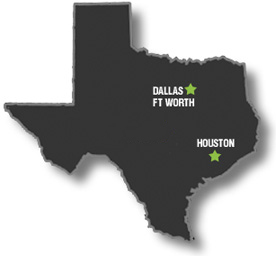 According to a report released in January by the Associated General Contractors of America, two metro areas in Texas – Dallas and Houston – had the greatest growth in construction jobs in the nation during the month of December. Houston added the most new jobs with 17,600 new jobs which was a 10 percent increase over December 2011. The Dallas area was the second in the number of new construction jobs in the nation with 8,300 new jobs, which was an 8 percent increase for that area. For the entire state of Texas, construction jobs increased 6 percent with 35,600 new jobs added. Out of 337 metropolitan areas nationwide, 139 showed growth in December over the previous year. The report contributed the growth in those areas to a rebounding housing market and in the private business sector. There were 131 metropolitan areas that had a decrease in construction jobs in December from the previous year, while 65 stayed the same. In terms of the percent of growth for an area, Pascagoula, Mississippi was highest with a 42 percent gain from the previous December, though the actual number of jobs was 1,900, much less than areas like Houston and Dallas. The Atlanta area suffered the greatest decrease in construction jobs at 4,900, which was 5 percent less than the amount the previous year. The largest percentage of lost jobs was in Jackson, Mississippi, which had 2,000 fewer jobs, which was 20 percent fewer than the previous December. AGCA attributed the growth in some areas to private sector demand for energy, health care, higher education, and residential construction. Fewer public sector projects were the cause of the decrease in the number of jobs in some areas this December from a year ago. Even with the growth in many metropolitan areas this past year, AGCA reported that spending on construction nationwide was still down $300 billion below peak levels. According to the report, there will be continued growth across the country, with more bids on projects and plans to hire more people. In a teleconference in January, the executive director of AGCA, Stephen Sandherr expressed optimism about growth from the private sector market, particularly hospitals and higher education institutions. However, rising materials prices and higher health care costs could still limit that growth. AGCA also conducted a survey of more than 1,300 construction firms, and reported that twenty percent of those companies were expecting overall growth in the industry for 2013, though more than half of the firms surveyed did not expect growth until at least 2015.